It's on a cold morning on the French Riviera that Rodriguez Group, exclusive distributor of the Italyachts series, announces the delivery of Phoenician (hull 34/01). This successful 34.11m motor yacht series, designed by Andrea Bacigalupo, is now built by Italyachts. Her sporty design allows large interior volumes. With an interior designed by Cristiano Gatto, Phoenician accommodates 10 guests in five cabins: a special VIP forward on the main deck, a full-beam master on the lower deck like the other VIP, a double and a twin. Phoenician is powered by triple 2,400hp MTU engines with two KaMeWa jets and a central booster. It gives a top speed of 40 knots and a cruising speed of 35 knots. 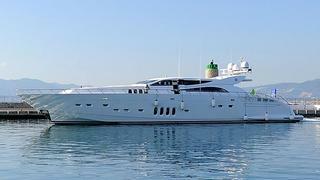 Phoenician will be available for the coming charter season, exclusively through Rodriguez Group.